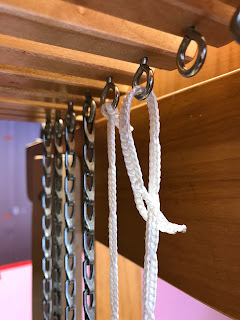 A few days ago, I read about a good way to secure Texsolv heddles on the open shaft bars on my Swedish type counterbalance and countermarche looms. 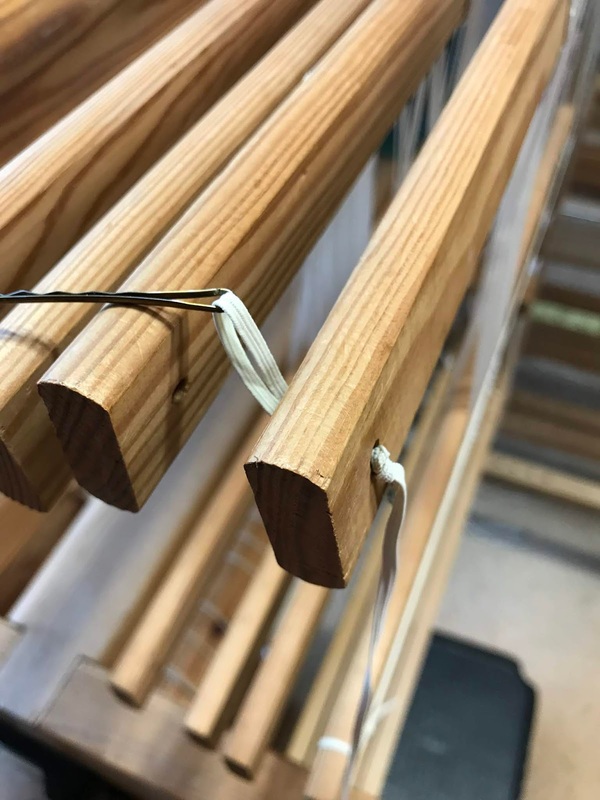 The shafts are two separate wooden bars with holes in each end to thread a string from end to end. The reason for the string is to maintain the order of the heddles if any were to accidently fall off the bar. After adding or subtracting heddles, I would sometimes not tie the security strings back through the holes, mostly due to laziness but I blame it on my arthritis in my fingers. I have no excuse now with this method. 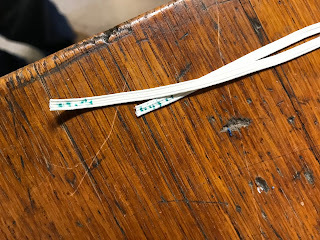 It involves using elastic bands instead of string. I used a roll of elastic I had in my stash from doll clothes making days. 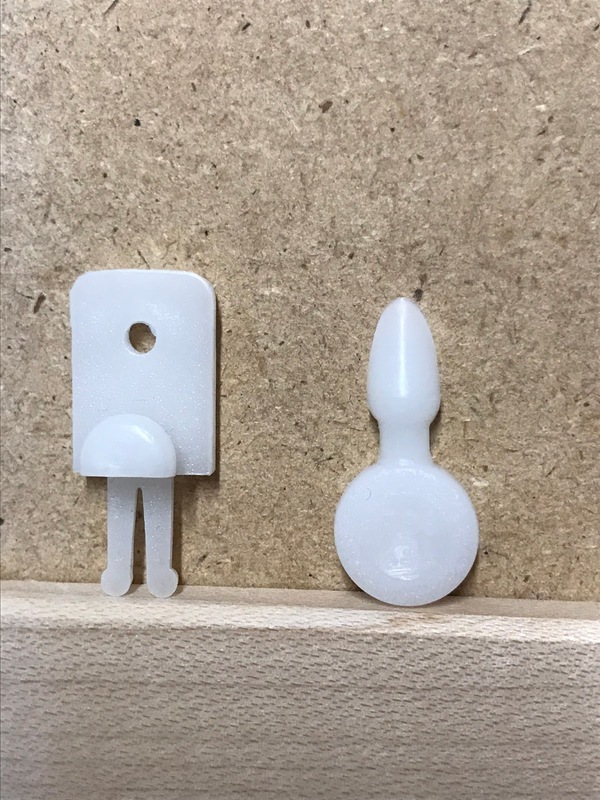 It is about 1/8" wide. 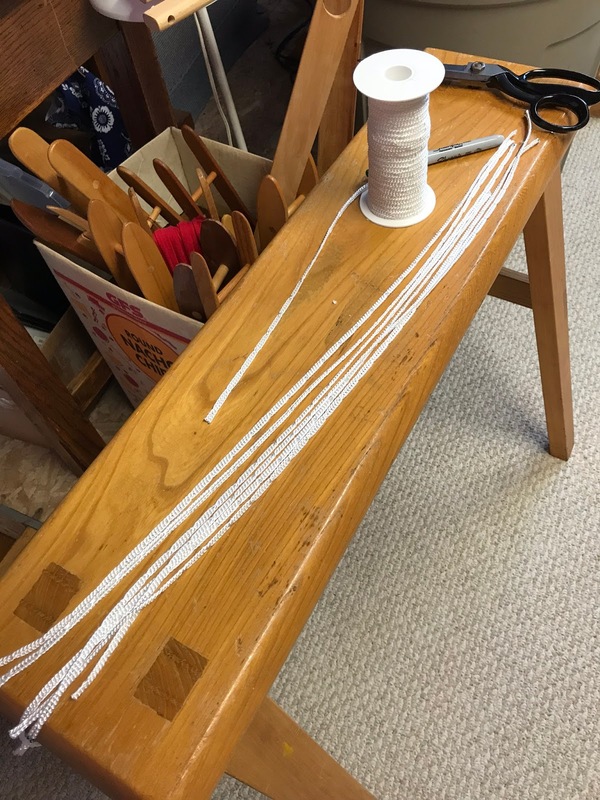 I cut two lengths approximately the length of a shaft bar. I tied a loop at one end of one elastic and kept the other as a guide to cut the rest of the bands. I put the first one on and adjusted the length so it had to stretch slightly and tied another loop at the other end. 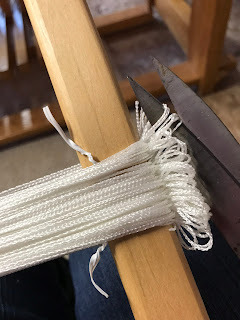 I needed to trim a little off the band to make it fit, so I trimmed the same amount off the second elastic. 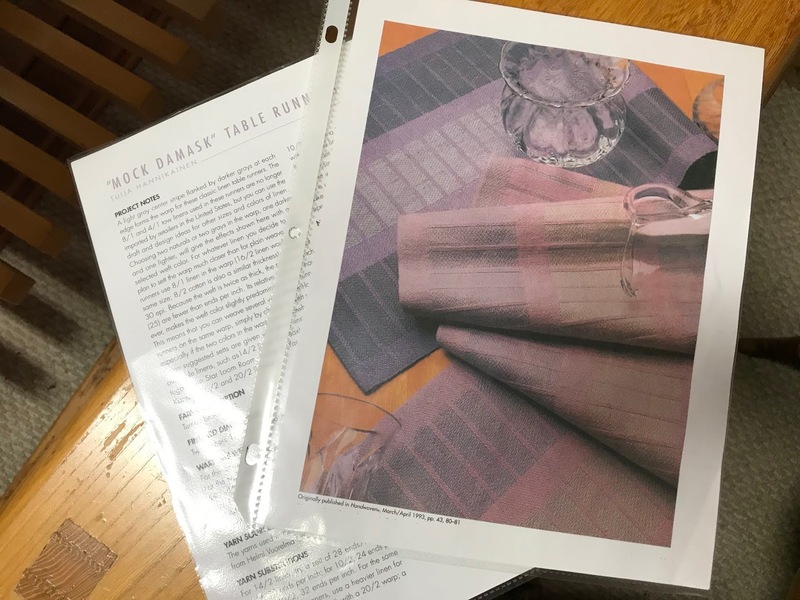 I marked both ends of my guide so I would be consistent in cutting the other eighteen pieces. 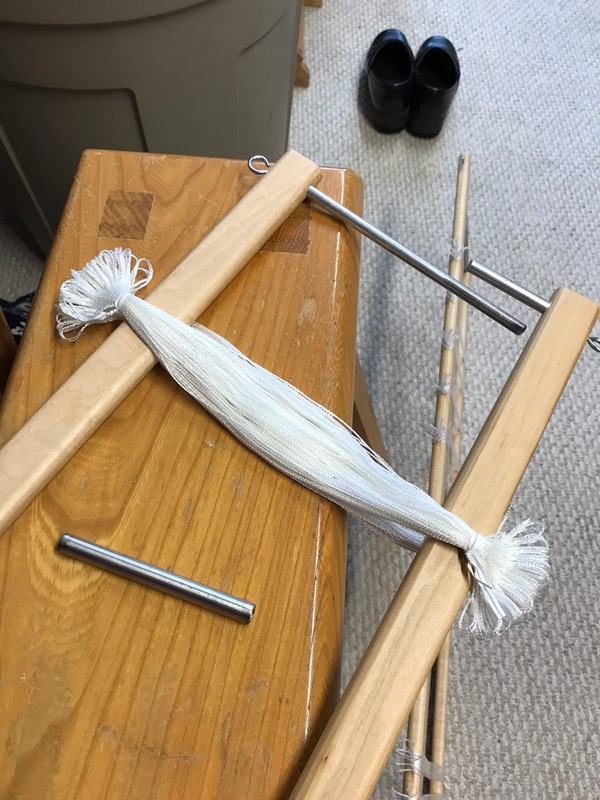 After tying loops on each end of all the remaining elastics, I started putting them on my shafts. 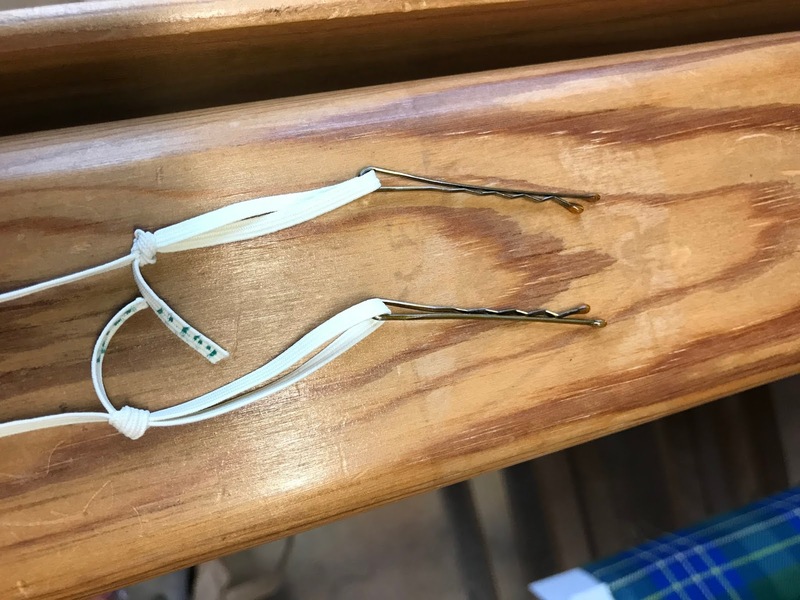 An easy way to thread the elastic through the end holes is to use a bobby pin. Thread the loop through the end hole. Wrap the loop around the end of the shaft bar and remove the bobby pin. With the other bobby pin at the other end, thread it under the strings holding the shafts. 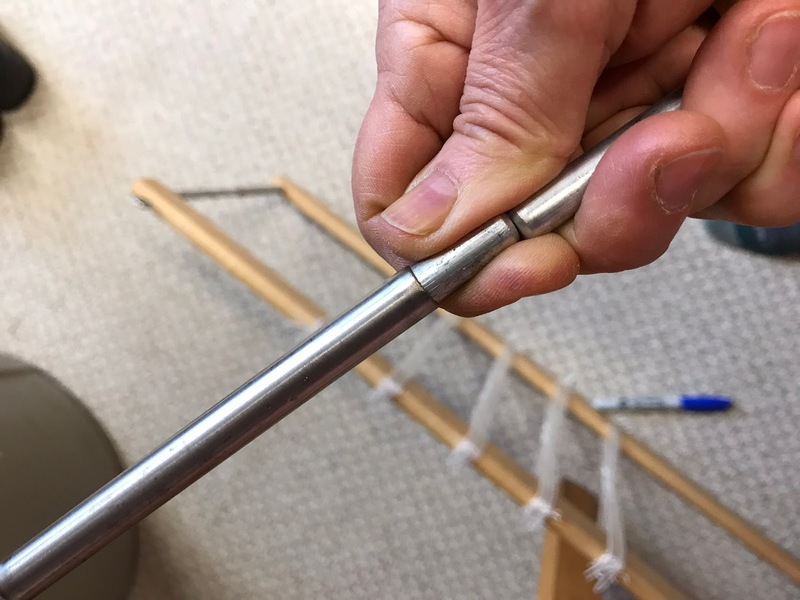 Thread the loop through the hole at the other end and stretch it around the end of the shaft bar. I keep a few bobby pins in my tool box, for threading the loops if I ever need to change my heddle numbers. 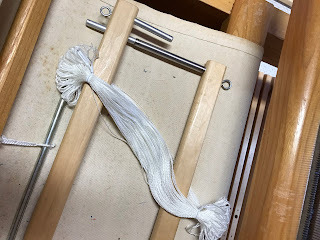 There is no excuse now to not secure the heddles, since I don't have to untie knots any more. The elastic slips on and off with ease. 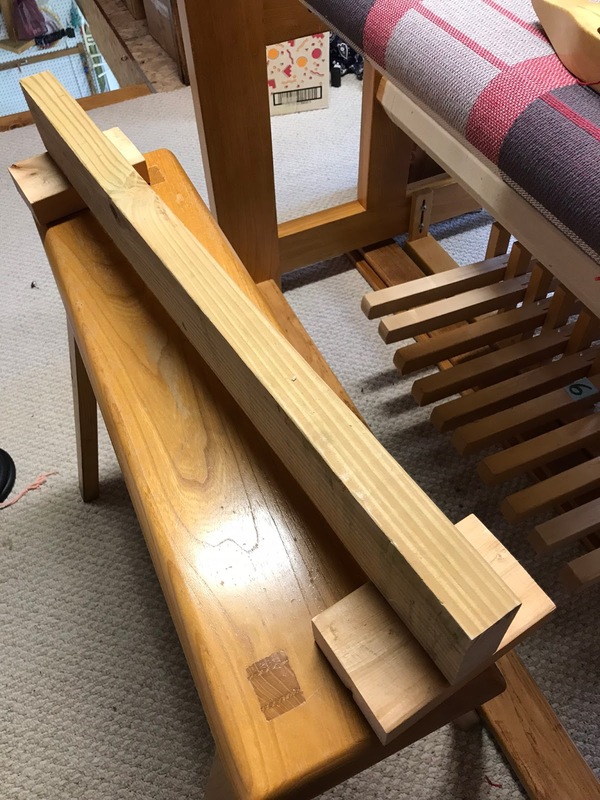 This is a continuation of turning my four-shaft loom into an eight-shaft loom. The rolls of Texsolv cording and the heddles I ordered arrived in the mail over the weekend. 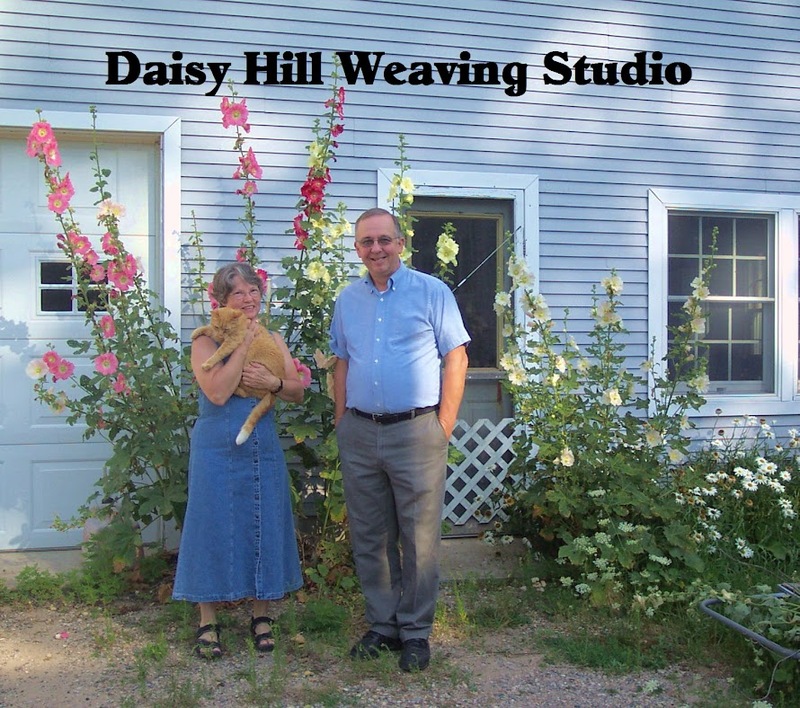 I was able to start cutting the cording after Bob helped me put the jacks, lower lamms and treadles on the loom. 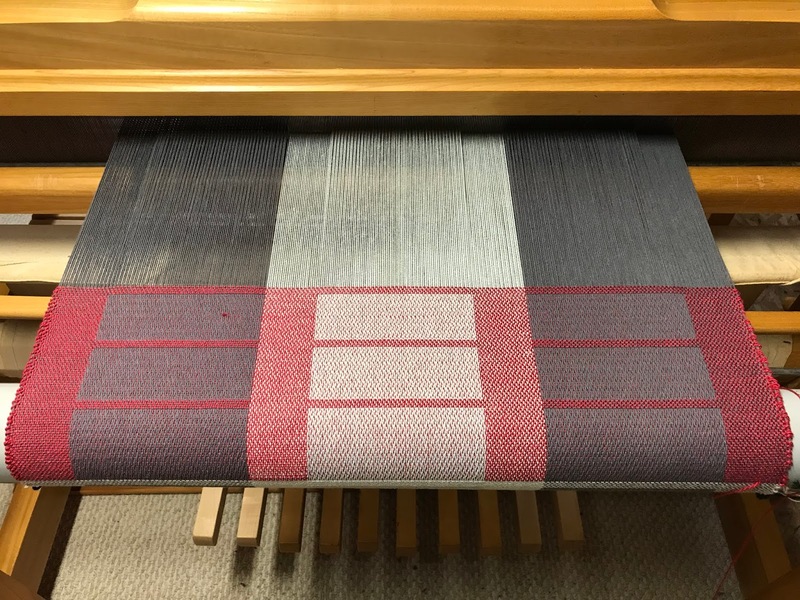 I measured each piece and tried it on the loom before cutting all of them. 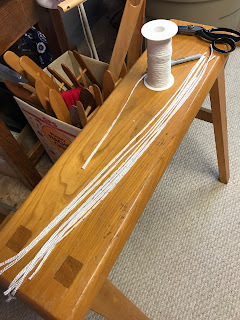 The cording is expensive, so I didn't want to waste any, since I was cutting four to eight pieces of each length. Each end of the cut cording needs to be melted so it won't unravel over time. 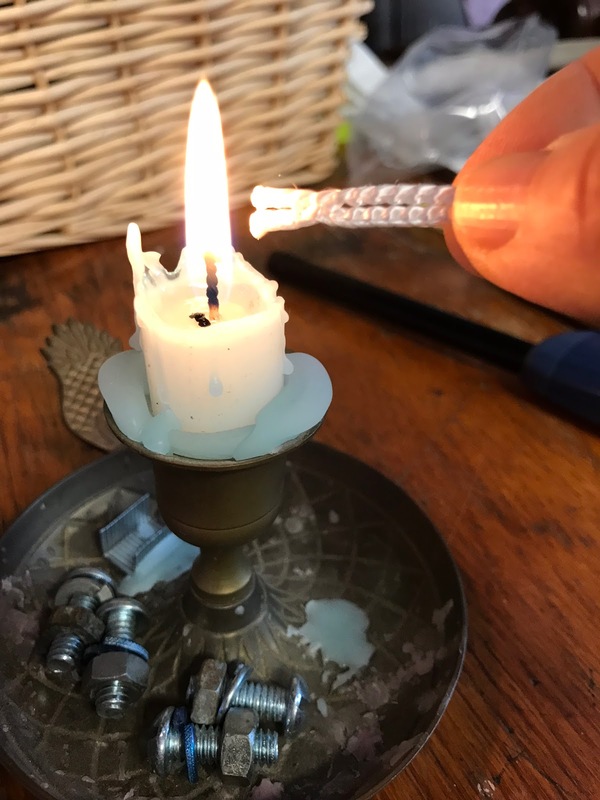 I use a candle so I don't have to use the lighter over and over. 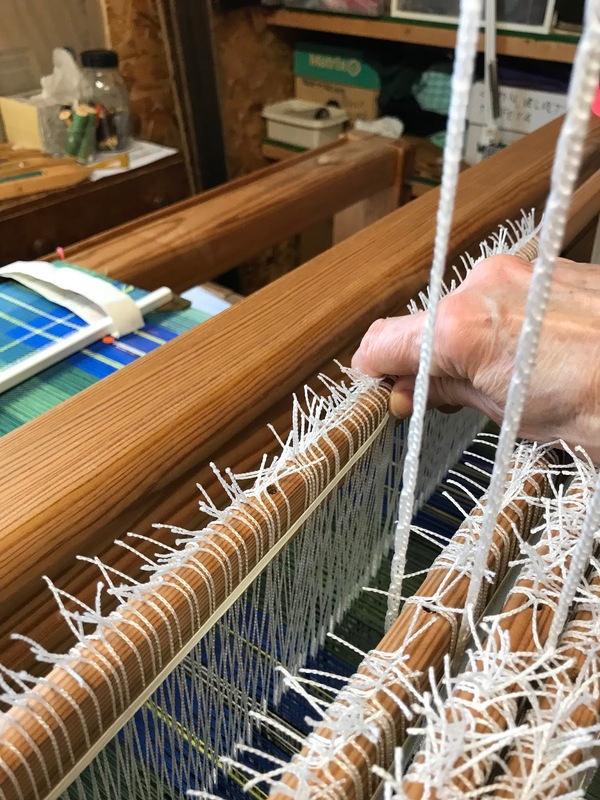 Working from the top of the loom, the short pieces that form a "v" at the center of the loom were attached to the jacks. I am adding a long piece at the bottom of the "v" that extends to the lower lamms. We had to take the lamms back off because we realized we forgot to add the hooks for the other end of the cord. 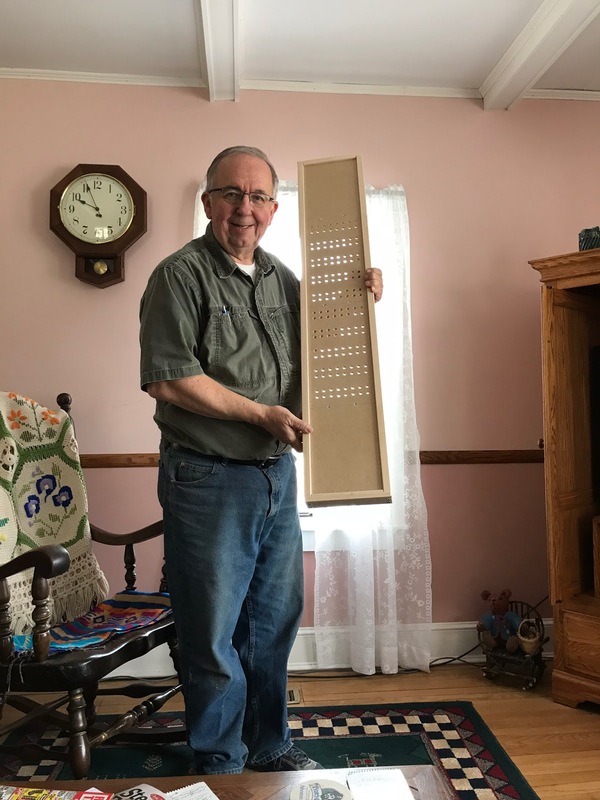 Bob needed to use the drill press. Next were the cords from the outer ends of the jacks to the four new shafts. 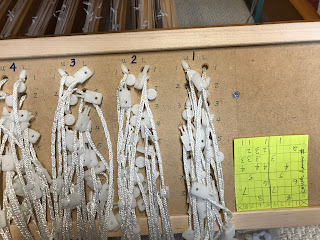 The cording works quite easily because of the evenly spaced holes. 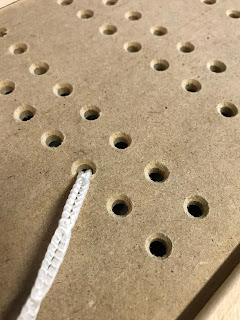 One end is threaded through the screw eye and the other end goes through the last loop on the cord and is then pulled tight. Bob was helping to prepare the shafts for assembly. 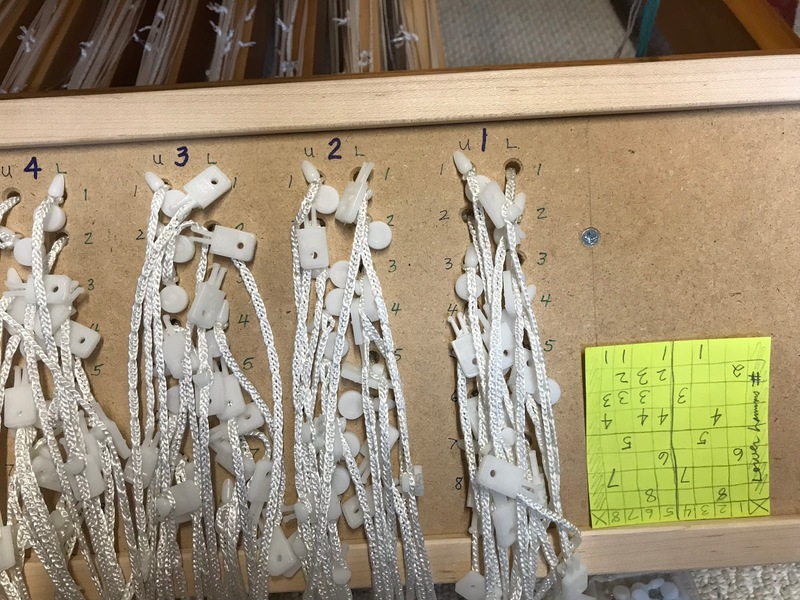 They are a simple design, with metal pegs in each end. 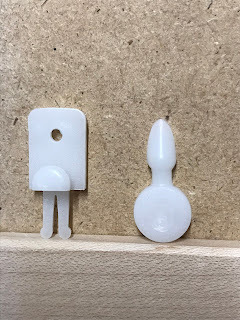 There is a short metal rod and longer rod and another short metal tube. 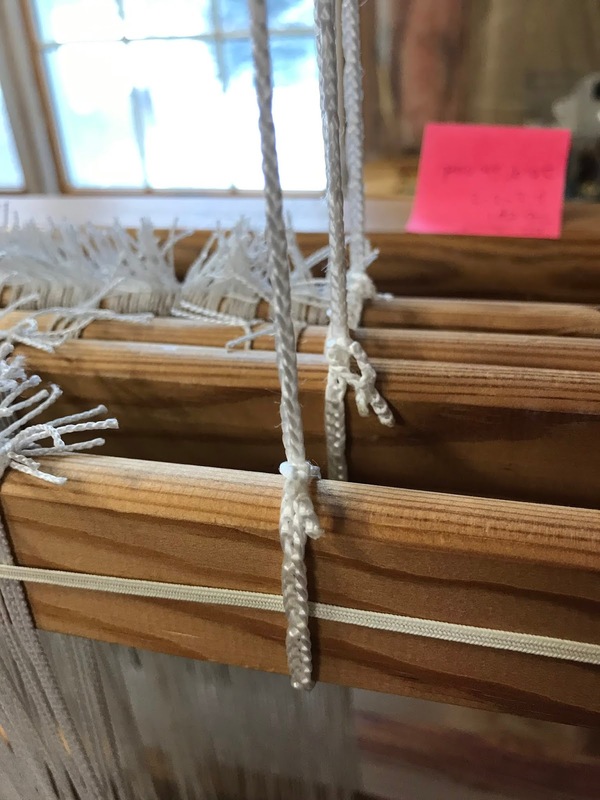 The heddles come in bundles of 100, with each end tied off with twist ties, so they don't become tangled. 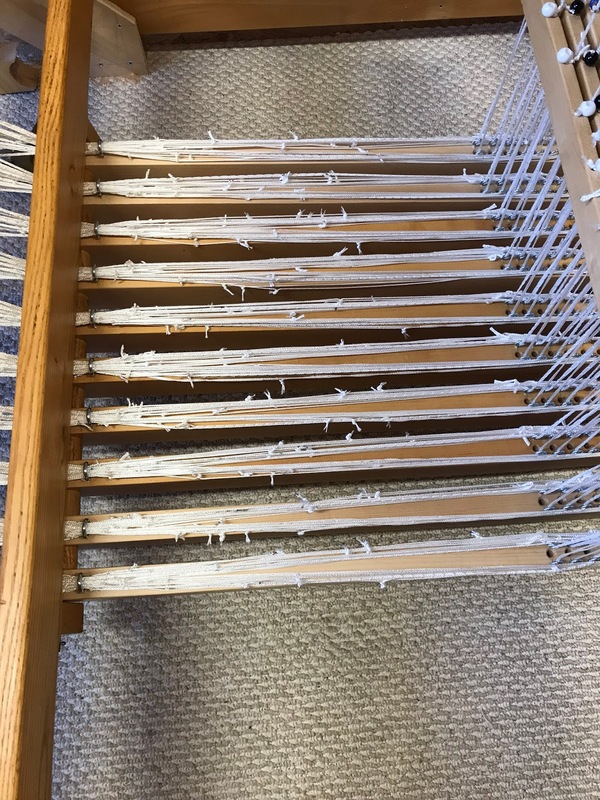 The ends of the heddles are slipped over the top and bottom shaft bars before joining the ends with the metal rods. The two rod ends are held together and the metal tube is then slid over the joint toward the bottom shaft bar. 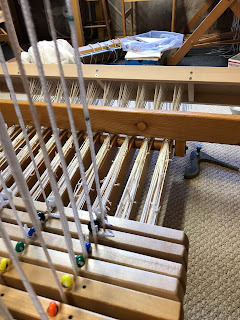 While the heddles were still in a group, I snipped the loops at the top and bottom so they can freely move on the shaft bars. 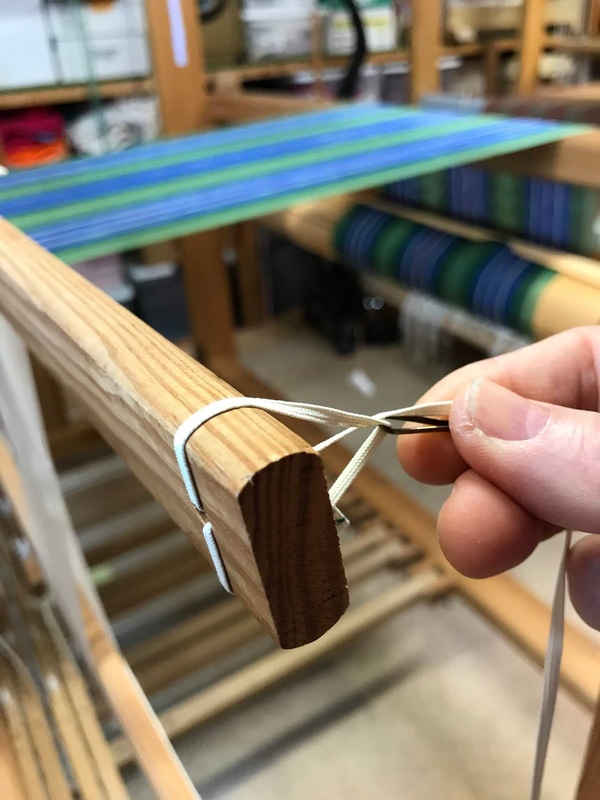 Keeping them together would make it harder to thread the loom. They should be clipped only after installing them. 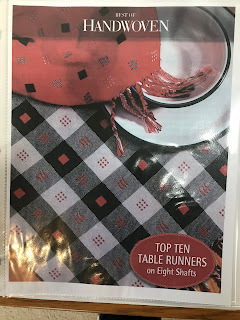 If I found I had ordered the wrong size, I wouldn't be able to return clipped heddles. 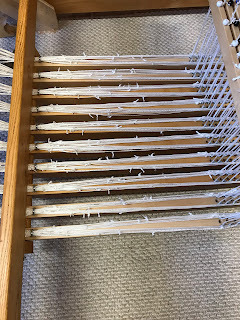 The heddles were very tight on the bars until I took off the twist ties and spread them out. Since I usually thread my looms from the center to the edges, I separated and counted half to each end of the bars. Having just had cataract surgery the day before, this was about all I could do today. Hopefully I can get more done tomorrow. About a year and a half ago, my daughter Carolyn and I took a trip down to Midland, Michigan to pick up an old four shaft Bexell Cranbrook countermarche loom. When we got it home and put together, I realized I could expand it to eight shafts, which means more design options for weaving. Bob and I went and got some hardwood and he cut all the new parts. 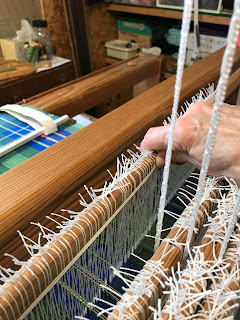 We have been working on them for quite some time, while weaving on some other four shaft projects on the loom. 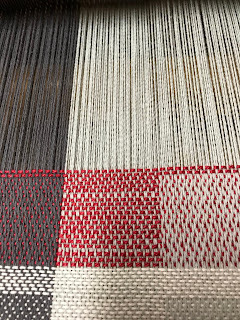 Yesterday, the twelve yard rug warp was completed, so it is now time to get serious about the expansion. Hanging in the basement workshop after varnishing them are the new shaft bars, and upper and lower lamms. The jacks are on the box on the workbench. 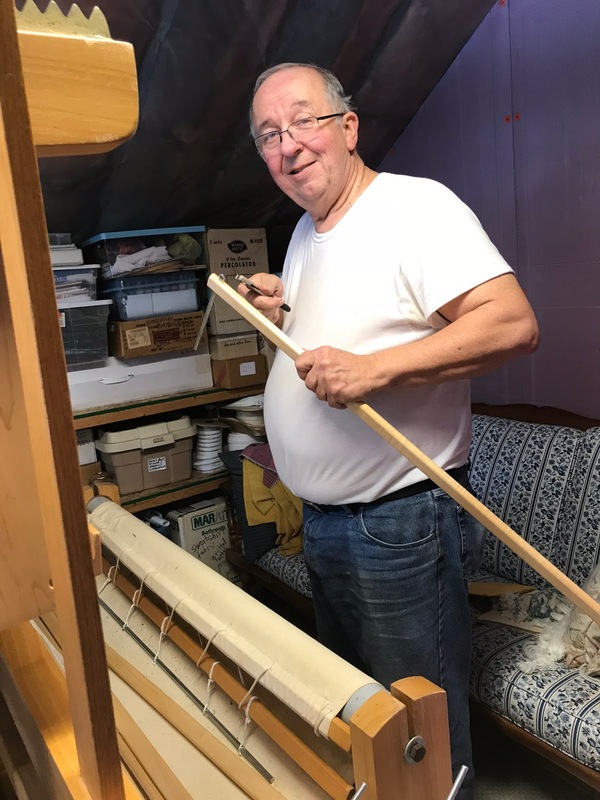 The treadles still needed some cutting, so Bob worked on that today. 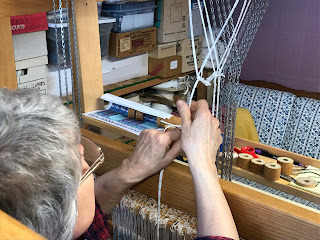 One of the original treadles is on top of one of the new ones. Bob still needs to cut away a little bit of the new ones and cut some grooves for the treadle locking mechanism. Unfortunately, the raw wood had some water drip off the roof onto them, so they will need to dry a while before I can put some finish on them. The locking grooves on the originals look like this. Bob had to chisel them into the new ones. I went down to the basement and checked them and can now sand the spots that got wet. The varnishing will have to wait for another day. These are all maple, like the originals. I'm really proud of the nice job Bob does on them. It isn't as easy working on hardwood as it is making something with a soft wood like pine. 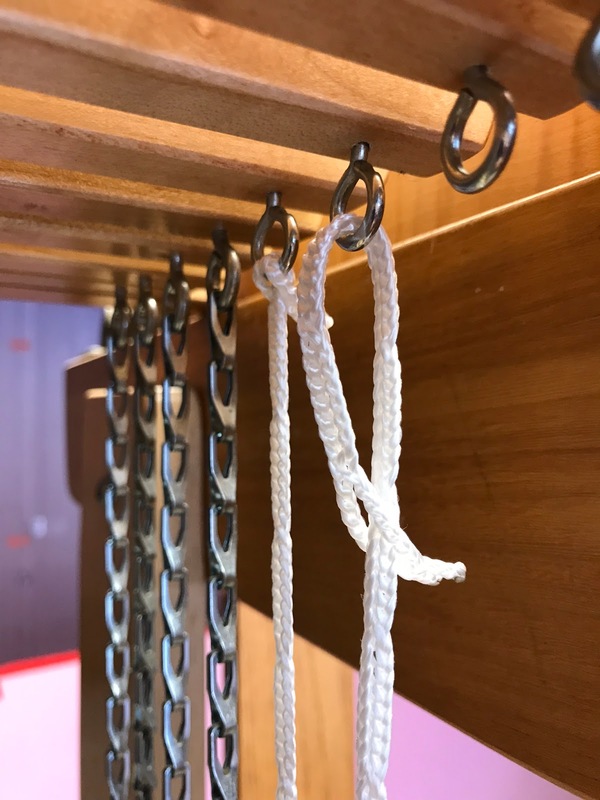 The treadles hang at the back of the loom and are separated by the upright boards to the right of the chains. 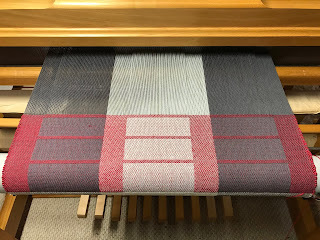 This photo is from the left side of the loom. 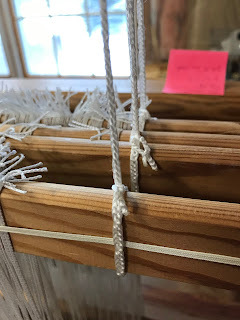 This is what the separators look like from the front of the loom. Towards the bottoms of them are notches, allowing the treadle to swing to one side and lock in the down position. 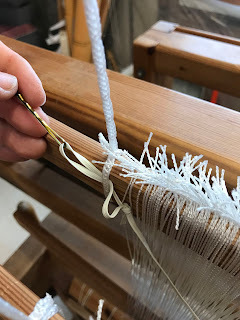 It is a nice feature for beginning weavers so they don't lose their place in weaving a pattern, and also for children, because it is hard for a small person to hold a treadle down and throw a shuttle at the same time. 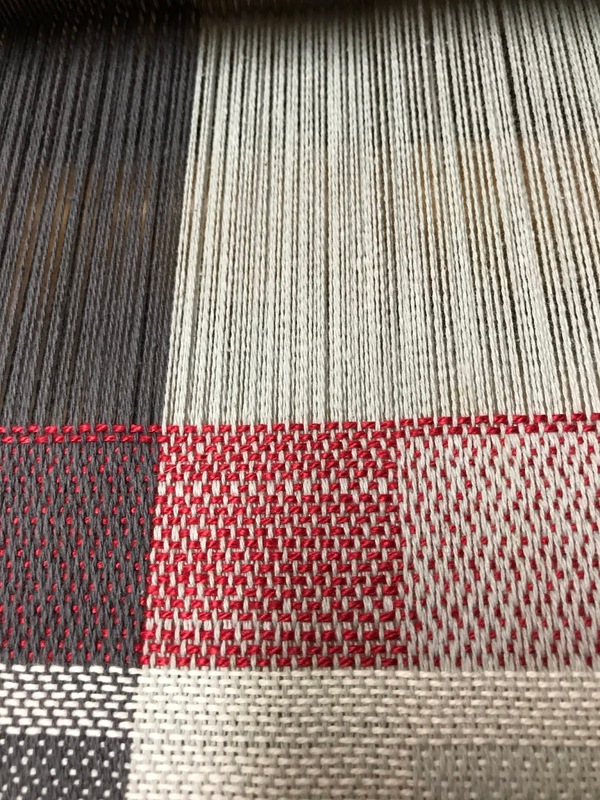 It also allows any weaver to weave while standing. Shaft bars, lamms, and jacks are on the dining room table with a coat of paste wax drying, getting ready for buffing. I did get them buffed and they are all ready for installing. 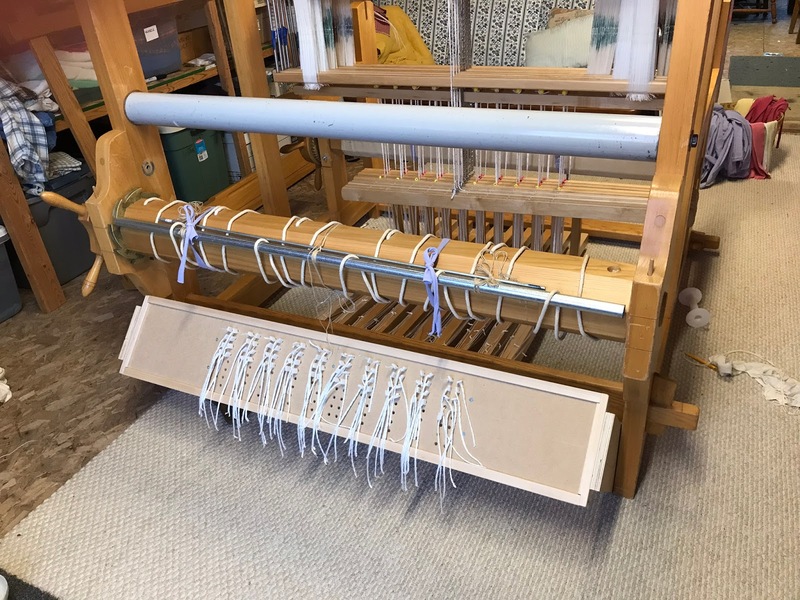 This is a view of the loom showing the jacks at the top of the loom and the chains that connect to the shafts. The gap is where the new ones go. After I get some measurements, I will need to go to the hardware store and purchase the chain. I will also need chains between the lamms and the treadles. I will price it out and then research a little to see if I could use a cording called Texsolv instead. 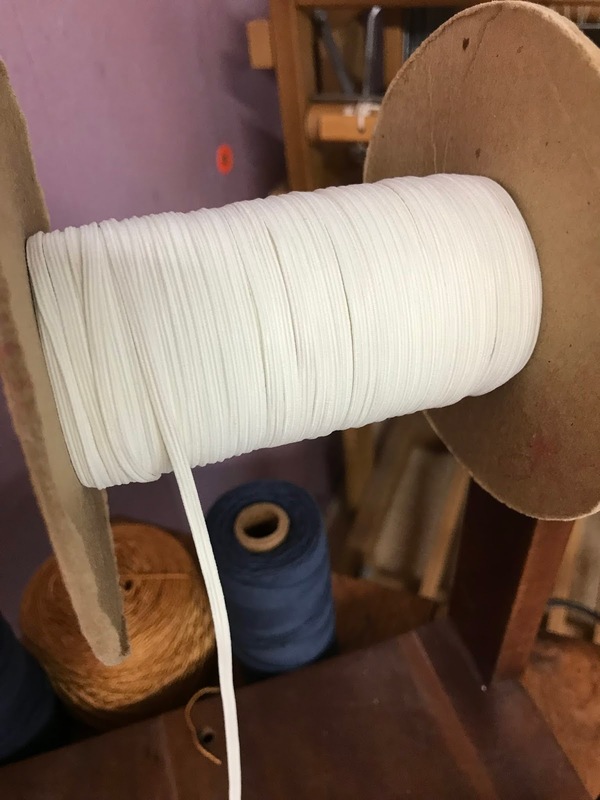 A lot will depend on the amount of weight the cording can take. That is all for today. I'm sure I have several more days before the treadles will be done and everything put together. I will be ready to put a new warp on the loom soon though. I made our cat Graycie a toy mouse several months ago with a scrap of wool fabric I had left over after making Teddy bears. She loves it and plays with it every day. She always seems to know exactly where it is, even when we can't seem to find it. 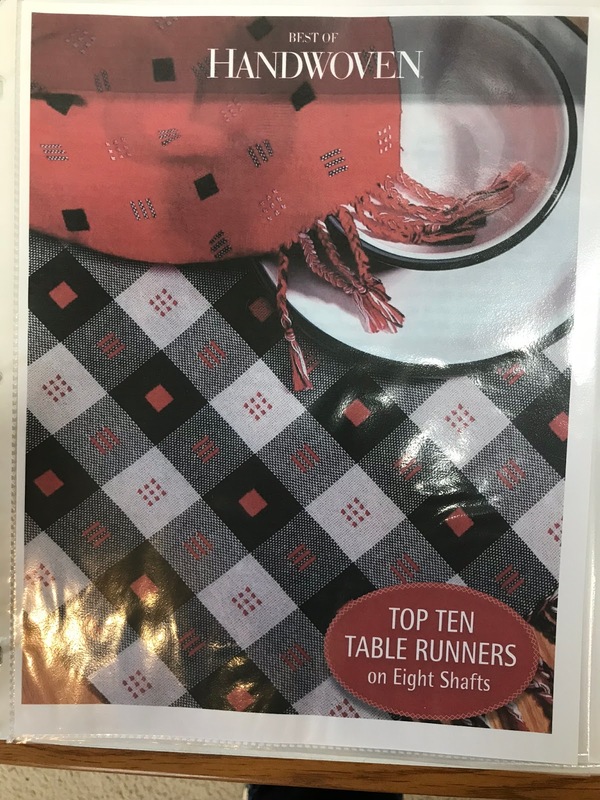 Here is the pattern and instructions, and below will be photos of the steps. 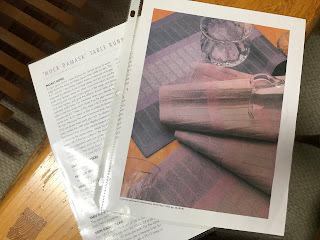 Click on the words below for a PDF pattern to print. The pattern is traced on the interfacing and stitched around before cutting out. Clips are made at B. Press under 1/4" and stitch down between B1 and B2. Cut slits 1/4" to 3/8" for ears. Cut out ears from thin leather scrap. 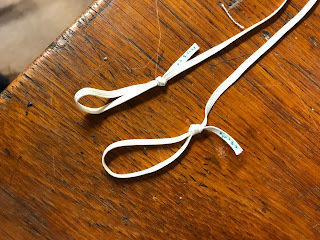 Fold ear and insert in slit. Fold fabric so raw slit edges are even. Zigzag through the ear and the cut fabric edges to secure ear. It should look like this on the right side. Cut a 1" strip crosswise from an old t-shirt. About 8" is enough unless you are making more than one mouse. Stretch the strip until it rolls into a narrow cord. Stitch the tail at A. I didn't like the red with this mouse, so I found another color. Fold body in half and stitch to where seam starts to curve. Fold the body like this, keeping tail centered. Turn over and stitch on the previously marked line. It should have a point with a bit of tail poking out. Turned right side out, it should look like this. Sew the remainder of the seam, backstitching at B. Keep the tail clear of the seam. Poke the sewn rear triangle inside and use the tail to help pull the body right side out. At this point, it looks like a fish with its mouth open. Stitch catnip bag. I used a piece of old sheet from my stash of rag rug strips. Stuff the empty bag inside the mouse body. Use a funnel in the mouth to add the catnip. Poke it in with the eraser end of a pencil. When full, gather the end and stitch closed. trim the excess fabric from the bag. Add a couple pieces of cellophane on both sides. I use cracker wrappers because they crackle. Cats like the crunchy sound. Poke them in with a pencil. 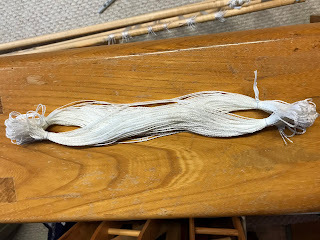 Hand stitch closed with waxed thread, using a ladder stitch. Done! Now to call my favorite kitty. I'm not sure if the video will work. I hope so. Graycie liked it.